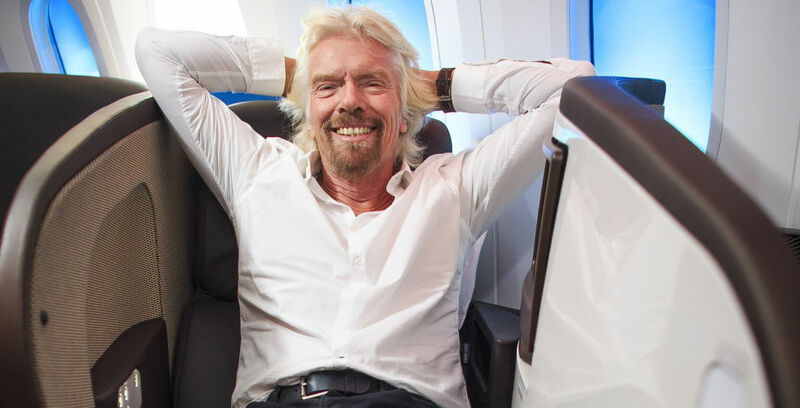 Richard Branson was in Dublin recently (Virgin Media bought UPC Ireland). He had these nuggets of wisdom for those who are either starting or growing in business. I started in business at 16. I left school because it wasn’t teaching me anything interesting. It’s a great time to start in business. 16-year-olds don’t have any baggage, they have nothing to lose, they don’t know how hard the future will be. They can just go for it. What we look for in new ventures are ideas that will make a dramatic difference in society. If we feel the idea is unique, and the team is great, we will invest. We invested in Twitter and Airbnb. I think the whole sharing economy is ridiculously exciting. There was no business plan for Twitter, but we invested in it because we believed in the team behind it, and we thought we’d have fun. I’m not a believer in business plans. If I did a business plan when I had a record company and one 747, it’s unlikely I’d have found anyone to invest in my future vision. You need to go by your instinct. If your instinct says ‘I think people will like this’ and you will get more money coming in each year than going out, go for it. And what about financial plans? Don’t worry about financial plans. If you’re trying to raise money, you’ll need some sort of financial plan to convince people to give you money. However, people reading those plans should know they are not worth the paper they’re written on. Why, because you can just throw in a few numbers here and there and make the company look profitable. What if your instinct is wrong? Your instinct may be wrong. I’ve fallen flat on my face many times in business and learnt from the experiences. I picked myself up when I fell and, fortunately, there were more successful times than not. That’s why I’m here today. You learn so much from your first adventure. The art of survival is the best education you can get. Also, learn how to delegate, it’s vital for business development. Find great people to work with and then you can move to bigger ideas. People who become entrepreneurs are lucky, it’s the best job in life, it’s great fun. However, expect hard work and lots of tears. But, if you have a great team of people with you can also enjoy the good times. Today’s entrepreneurs have something we didn’t have back then, the Internet. That means you can become ridiculously powerful and big in a short period – if you get it right. Nowadays we have over 30 million followers on social media. We don’t have to rely on the Daily Mail or The Times to get our message across. If we want to communicate to millions of people, we can do so instantly. The important thing is to be credible and honest. Then people will interact with you in meaningful ways. When I started in business 50 years ago, there were almost no entrepreneurs and the word didn’t exist in common parlance. There were two of us for a long time. Myself and Anita Roddick, and we were wheeled out for every interview. I was competing with British Rail, British Telecom and British Airways, big national companies. They were badly run because they were run by the government. Governments can’t run companies. We had a blast doing it. Now there are lots of entrepreneurs and lots of great ideas and lots of finance available. There’s also the Internet to help market your idea. I’m not regretting anything, but now is a great time to start a business. How much better would it be for the country if there were hundreds of thousands of new businesses started each year, and how much more likely would you get your money back from a business owner as opposed to a graduate? The British Government agreed. If Ireland isn’t doing this, I’d recommend it starts immediately. Governments are very inefficient. There is an exception. I’ve been to Singapore and met the Ministers. There are very few of them, and they are very well paid. The Minister for the Environment gets paid $1.8 million a year, for example. The ministers are the best in the country at what they do. And they deliver. If I led a government, I’d reduce the numbers in parliament, and I’d recruit ministers from all walks of life. I’d pay them well, but they’d be the best at what they do, and they’d run efficient departments. I’d encourage people to throw suits and ties away. Business suits and ties give this image of business people as static and unapproachable. Business people are creative people and create things that often help society. Why walk around wearing something that’s going to put people off? The one piece of advice he’d give someone starting in business? Don’t sit around thinking about it. You learn from everything you do. Start. Screw it, just do it.